CMK 2010 – A Huge Success! Constructing Modern Knowledge 2010 exceeded my wildest dreams. The quality of the speakers was only surpassed by the energy level and amazing project work engaged in by the participants. Brand new teachers joined school administrators and edtech veterans in our learning environment rich in objects to think with. K-12, higher-education and multiple disciplines were all represented by participants contributing to each other’s knowledge construction. Best of all, many CMK 2010 participants blogged about the experiences. Please take the time to read the thoughtful reflections of these terrific educators! 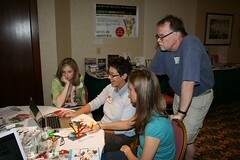 It was fantastic to have Science Leadership Academy Principal Chris Lehmann as a participant in CMK 2010. Here are a few excerpts from Chris’ blog, Constructing Modern Knowledge Reflections. …I was reminded of how powerful — and how frustrating — problem-solving and building can be. I also was reminded that we can work with our hands, we can listen and engage our minds in the world of ideas, and we can speak from our hearts. A great classroom should allow us to do all those things, with teachers who recognize the highs and lows that can come with all the different ways we learn. Thanks, Gary, for a great week. 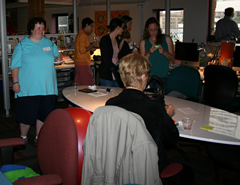 Angie Abbott reflected on her second year at Constructing Modern Knowledge in her blog post, Because Shift Happens. Unlike other conferences where you sit and listen to experts speak, at CMK not only do you listen to them speak, but you get to have conversations with the experts. Heck you get to do more than that you get to spend time with them, eat lunch with them, even share the pool or hot tub. This year’s experts were Gary, Sylvia, Alfie Kohn, Debra Meier, James Loewen, Cynthia Solomn, Brian Silverman, Artemis Papert, and John Stetson. There were other experts in the room but they were their as participants. Dennis Harper was there and so was Chris Lehmann. I can’t tell you how excited I was to be able to spend time and have meaningful, real talks about everything with these amazing people. I must admit I wasn’t sure how I would deal with Alfie’s views on competition or no grades, but it resulted in a discussion with Sylvia that I will treasure. The conversation between Alfie and Debbie was, well there are no words to describe it. Yes, it was that good. I spent time with Cynthia at Fablevision discussing leadership and progressive education. I came away knowing I had made a new friend. And that is only the “experts”. Don’t get me wrong the experts were that worldly and incredible, but so were the participants. Brian Smith captured some of the things that make Constructing Modern Knowledge in CMK: Not Your Father’s Conference. …I did not leave CMK with a new tool (though I did share the Lego Tool with anyone cared to listen or try it) or the latest strategy for using Web 2.0 tools. Here are some of my takeaways. to develop a better environment where learners feel comfortable and safe (not just physically safe, but mentally safe to take a risk, ask a “silly question” or challenge someone (thanks to John Stetson for being the gear bully and not just giving the answer to our problem of torque). No, CMK is not your father’s conference. It’s not a conference at all. It’s a learning experience. 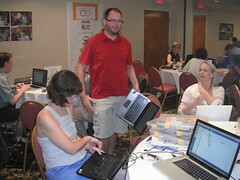 Illinois high school English teacher, Kate Tabor, spent her time at CMK 2010 learning to program in Logo (MicroWorlds EX) as a way of exploring Shakespearean language (via randomness). After CMK, Kate headed to Oxford University in the U.K. to study Shakespeare. Her “messing about” with language connected mathematics, computer science and literature in a playful compelling fashion. Kate’s first blog describes the first two days of her adventures in Manchester. I am at the most intimate conference on education that I have ever attended. I sometimes feel like I hear about a conference just after the conference has reached its point of bloated and oversubscribed. We sit for hours in ballrooms watching yet another PowerPoint presentation or the feverish exhortations of the keynote speaker. By the early afternoon yesterday I was already engaged in learning something new. 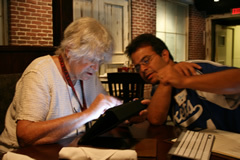 I was learning LOGO programming from the people who developed it. I had enjoyed a morning of listening to and thinking about history with Jim Loewen and had a terrific conversation with him about the Parker Stories Project. He confirmed my idea that it will take three to five years to finish it the way that I envision, and he was excited about it as real history. 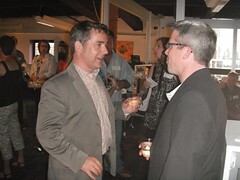 He encouraged me to think about the process as I went along and to write about that process, its challenges and successes. In the end there can be two written documents: the history itself and the meta-analysis of getting there. …And all of this in a room of 50 people. And I was worried that I might need the secret handshake to feel part of the work here. Nope. And I don’t think we need to break out the foil hats either. Kate then explains her project-work in this blog post. At CMK10 I spent time working on a computer program that would randomly generate a Shakespearean insult from a list of nouns and adjective phrases. With much trial and error, using other programs as models, and reaching out to the people around me when I had exhausted my own abilities to find the answer, I was able to get the program to not only create an insult but to have a second avatar randomly generate a witty (or lame) riposte. I then tried to create a second program that created a tessellated image. What did I learn from this? Well, writing a program is like constructing sentences, and each sentence has an internal grammar and syntax. You have to get this right or your request is not communicated correctly. Then you join the sentences into a coherent paragraph, and the requests run one after the other. The parallels to writing are exact. But here is the difference that I need to understand. I spent HOURS making certain that each semicolon and bracket was is the right place so that my programs would run. Sure, it got easier. But it was acceptable for me to spend hours getting it right. It needs to be acceptable for my students to spend time, extended time, working on constructing sentences in English. Where does the comma go? Which word changes the meaning? I need to give them the time and honor that building process. Joe Virant of Texas wrote the following on his blog post, Sometime the Choir Needs to Sing. CMK10 invited me to be myself, take risks, and play, all out in the open and with the support of a wise, accepting community of co-teachers and co-learners. I did much more listening than talking over the days in Manchester. From the opening conversations the night before the institute began, I had a feeling there was no need to hold back. While many institutes have big, fancy mission/vision/values/goals-type posters (laminated, in fact, because they aren’t meant to change or evolve), CMK was customized in every sense of the word. Gary and the faculty offered the right conditions and support to us, and we in turn took our projects in any direction we chose. Imagine what it’s like for our young students when we offer them the same courtesy. …Constructing Modern Knowledge 2010 was exhausting. 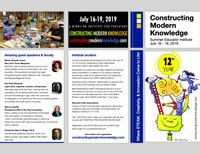 Constructing Modern Knowledge 2010 was exhilarating. When can we do it again?! …It was last year, at Constructing Modern Knowledge 2009, that I made a commitment to build more observation into my days. As I reintroduced myself to the practices of Reggio Emilia, I was reminded how powerful observation and reflection is. It is not a luxury or a way of disconnecting from what is going on. It is a way of connecting the learning to the learners and of building a solid learning environment that is directly linked to the learners that are present in the environment at the actual moment. And, with the current technologies we now have, we can document the learning and share it with the children, parents, other teachers, administrators, and the community. …I left this year’s Constructing Modern Knowledge with a renewed sense of the power of sharing. There were many ways of sharing during the institute, whether it was as a speaker, asking questions to the speakers, joining in a small group discussion, exploring what others were working on, appealing for help or providing help, having a conversation, or by presenting a finished product. 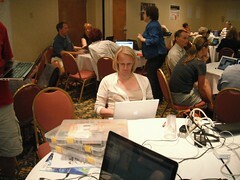 Our reigning champion is Jenni Orr who penned six blog posts about her experience at CMK 2010! 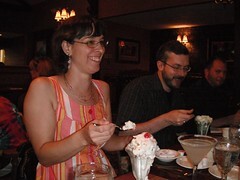 Jenni came to CMK with her university history teacher husband, Jeff McKlurk.